The album is divided into an electric and an acoustic side, although the acoustic side included some tracks in which other instruments were backing up Dylan and his guitar, but no drums were used. 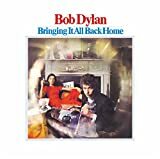 On side one of the original LP, Dylan is backed by an electric rock and roll band—a move that further alienated him from some of his former peers in the folk music community. Likewise, on the acoustic second side of the album, he distanced himself from the protest songs with which he had become closely identified (such as "Blowin' in the Wind" and "A Hard Rain's a-Gonna Fall"), as his lyrics continued their trend towards the abstract and personal.